Badeværelse med bruser, håndvask, toilet og bidet. Bemærkninger om indkvartering: Del af "Old Mill" (Il Mulino Vecchio) i Castello di Gaiche. Egnet til børn. Centralvarme og brændeovn. Udenfor: Privat overdækket terrasse, privat have, stor slot have med mange siddepladser områder med en fantastisk udsigt. Stor pool, til brug af gæster på kun Castello di Gaiche. Rengøring / håndklæder / linned / stuepige service: Rengøring, håndklæder, sengetøj og rengøring. Die Ferienwohnung ist landschaftlich außerordentlich schön gelegen. Sie ist geschmackvoll und gemütlich eingerichtet und gut ausgestattet. Gerade deshalb ist es bedauerlich, anmerken zu müssen, dass die Ausschreibung nicht bei allen Angaben der Realität entspricht. So gibt es kein Internet/WLAN und kein TV. Sicher kann man auch ohne WLAN und TV schöne Ferientage verbringen, doch sollte man sich dafür bewusst entscheiden können. Deshalb ist es empfehlenswert sich genau zu erkundigen, ob die Dinge vorhanden sind, auf die man Wert legt. In diesem Zusammenhang ist zu erwähnen, dass die aufgeführte Waschmaschine nicht zur Ausstattung der Wohnung gehört, sondern für die Gäste nur eine Waschmaschine beim Swimmingpool zur Mitbenutzung zur Verfügung steht. It is correct that there is no WiFi at the house in Gaiche. In Europe there are data roaming laws that enable you to enjoy mobile internet as you do at home. A television is present, it has a built-in dvd player and there are some dvd's at the disposal of our guests. However, tv has no antenna/cable connection. We also provide a nice collection of books ;-). Many thanks again, also for your kind email, and we are looking forward to having you as our guests again. Die "alte Mühle" gehört zu einem Castello aus dem 14.Jhd, das mit Unterstützung der EU so restauriert wurde, dass man alle Annehmlichkeiten der "Neuzeit" genießt und dabei den Charme de Mittelalters genießen kann. Wunderbar ist die überdachte Terrasse vor dem Appartment inmitten von Olivenbäumen und Rosmarinbüschen, der große Garten, der weite Blick ins umbrische Land, die Ruhe dort oben, der Swimming Pool nicht zu vergessen. Many thanks for your fantastic review! We love it when Gaiche is enjoyed and loved so much. Looking forward to having you as our guest again! We had a fabulous holiday in this gorgeous cottage, which is set in idyllic countryside at the top of a very windy hill. The views are stunning and we enjoyed the peace and quiet, the only noise coming from the very vocal crickets. The outside covered seating area was especially wonderful with a lovely view over the peaceful garden. The cottage had everything we needed and we loved our stay. Our 5-year-old daughter particularly enjoyed the bunk bed in her bedroom. We met a few of the residents from the other privately owned apartments and they were very friendly. The pool was delightful and we loved the fact it was a short distance away from the apartments, we had it to ourselves on some occasions. Umbria is a very beautiful part of Italy with many places to visit which weren’t too far away. We would have liked a little more information about the Castello and the local area. The only negatives if you can call them that, was the microwave did not work, which wasn’t a big problem, we reported this to Francesco early on in our stay but it wasn’t fixed before we left. We also managed to trip the electric which we were aware could happen from the reviews on this site, but had it not been for the neighbours who were only too happy to help, we wouldn’t have known how to get the power back on without contacting Francesco – perhaps some instructions in the cottage would be helpful. This a beautiful place to stay and I would highly recommend it. Many thanks for your elaborate and nice review. The microwave has been replaced as quick as we could. And thanks for your feedback on the availability of information about Castello di Gaiche. We have a digital brochure that we send out, it contains info about the surrounding villages and tips for restaurants! Thanks again and we are looking forward to having you as our guest again. This is a gorgeous little house - not lavishly equipped, but with everything we needed. Part of a small hilltop community at the end of a perfectly windy road - we were bowled over by how special the place is. Immediate access to terrace and a garden with sun all day, trees for shade, heavenly views, lingering sunsets and the odd extremely quiet neighbour. Utter peace and quiet - we were woken only by the birds and untroubled by the internet. Loved the fact that the commodious swimming pool is a step or two apart , and can neither be seen nor heard. Take detailed maps for walking/exploring as there are none in the house, and a portable light so you can see what you are doing at the cooker. Also be aware that if you switch off the plug under the boiler cupboard in the kitchen - you'll turn off the hot water boiler. We longed for more information about the castello, but apart from that it was a perfect, utterly peaceful and beautiful holiday spot. Many thanks for taking the time for this review. We love to hear that you had a great stay. We also thank you for your feedback and will definitely take this into account. Ruhiger Wohnung , mit schönem Garten mit herrlicher Aussicht. Etwas abgelegen auf einem Berg. Dafür gut zum Entspannen. Der Garten hat eine herrliche Aussicht. Im Umkreis von 1 Autostunde sind etliche Sehenswürdigkeiten. Many Thanks for your kind response. We are happy to learn that you enjoyed the beautiful garden of Castello di Gaiche. We love the smells and tranquillity as well. Hope to welcome you again! Perugia er berømt for sine sprogkurser. Perugia: 30 minutter. Rom (både Fiumicino og Ciampino): 2 timer. Firenze: 2 timer. Pisa: 3 timer. Perugia: 20km; Siena: 50 km; Assisi: 50 km. Mange meget fine restauranter i området, kan vi give tips. Tavernelle har gode supermarkeder og et lokalt marked hver mandag morgen. Slottet har lokale ledelse til at byde velkommen og tage sig af gæsterne. Booking Notes: Timing of payments: 1/3 to confirm booking, full payment due 4 weeks before arrival. Changeover Day: Season: Saturday. Out of season: flexible. Notes on prices: Prices are for 2 persons, please add €50/week for extra persons. Prices include linen, towels, use of pool, use of gas/electricity and cleaning. 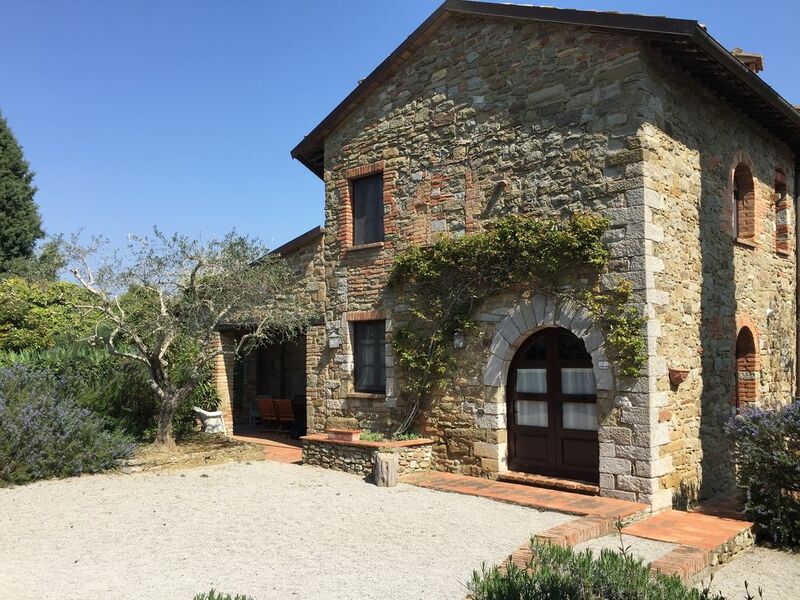 There is also local management at the disposal of guests of Castello di Gaiche.